This week marks the end of the fourth full year of this golf column. Cape Region golf went through a wide-ranging mix of changes and accomplishments. January–Butch Holtzclaw describes the differences and similarities in working as a golf professional at private and public facilities. A two-part series explains how traffic impact studies can determine whether a golf course-related residential development proposal will have a chance to obtain county land use permits. February—PGA Tour rookie Pat Perez shows how losing one’s temper won’t help win a golf tournament. Cripple Creek Country Club golf professional Bob Crowther discusses his recent bout with serious illness and his slow recovery. March–Kyle Serman, who chairs the Delaware Technical and Community College’s Applied Agriculture Department at the Owens Campus in Georgetown, talks about the College’s new Golf/Turf Maintenance Lab and the stormwater permit approval process the school underwent for its two-hole project. A column about golfing in a gentle winter rain makes the point that any golfer who stays out in that stuff is probably happy to be there, regardless of the elements. Cape Henlopen High School’s golf team starts its 2002 season with a victory over Delmar. April—Shannon Prettyman signs a letter of intent to play golf for Mount St. Mary’s in Maryland. In local golf action, Cape wins matches over Lake Forest, Seaford, Smyrna, and Caesar Rodney, while losing to Milford. The team members also describe their practice regimen, which should help other golfers. Kings Creek CC hosts the spring edition of George Washington University’s Rehoboth Beach Invitational. May—Cape Henlopen finishes its season with three wins over Sussex Central, Seaford, and Polytech, and one more loss to Dover. The team’s tendency toward erratic play leads to a ninth place finish in the state tournament, despite Tyler Witman’s second place individual performance. The spring golf trip to Sunset Beach combines good friends, good times, and bad golf. June—The annual Rehoboth Beach Junior Open continues its popularity with dozens of kids competing. Christina Wagamon receives the top scholarship and plans to use it to attend Catawba College. The U.S. Open at Bethpage Black produces memorable moments. July—The folks at Clubhouse Golf show off their computer simulator. I confirm my ability to hit a slice there just as easily as I can out on the golf course. The other local golf business, Cyclonic Golf, proudly displays their newest line of golf shoes. August—I confirm the limits of my skills at match play. A dry creek bed at Shawnee CC provides stark proof of the summer’s drought. Devon Peterson introduces himself to Cape Region golfers as Shawnee’s new golf professional. September—Area golf courses mark the first anniversary of the September 11 terror attacks the best way, by operating normally. The new golf holes at Delaware Technical & Community College are looking good for completion by next spring. October—The George Washington University Rehoboth Beach Invitational college golf tournament becomes a twice-a-year event, thanks to its popularity with East Coast teams. Cape Region golf superintendents tell some of their secrets to handling the geese problem on their courses. November—The Shawnee Shamble proves to be a fun tournament format. It turns out that I’m not so hot at reading the weather radar when there’s a threat of rain. A friend of Cape Region golfers is surprised to find his picture on billboards along the Interstate. The area superintendents discuss their plans for winter renovations and repairs. The new list of Christmas golf gifts to avoid is out. 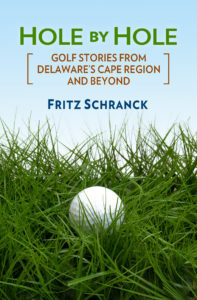 December—The annual golf book gift guide highlights several coffee table picture books among other options. Area golf clubs and merchants provide valuable shopping discounts and other enticements for other golf gifts.